ضیاءتوانا, محمدحسن. (1396). جایگاه عناصر سنتی شهر شرق اسلامی در ریخت شناسی شهر قدیم لار. معماری و شهرسازی آرمان شهر, 10(21), 365-375. محمدحسن ضیاءتوانا. "جایگاه عناصر سنتی شهر شرق اسلامی در ریخت شناسی شهر قدیم لار". معماری و شهرسازی آرمان شهر, 10, 21, 1396, 365-375. ضیاءتوانا, محمدحسن. (1396). 'جایگاه عناصر سنتی شهر شرق اسلامی در ریخت شناسی شهر قدیم لار', معماری و شهرسازی آرمان شهر, 10(21), pp. 365-375. ضیاءتوانا, محمدحسن. جایگاه عناصر سنتی شهر شرق اسلامی در ریخت شناسی شهر قدیم لار. معماری و شهرسازی آرمان شهر, 1396; 10(21): 365-375. استاد جغرافیا، دانشکده علوم زمین، دانشگاه شهید بهشتی، تهران، ایران. شهر این دستاورد زنده و پویا بشر، همچون دیگر سکونتگاهای انسانی، پیوسته به منزله یکی از شاخص های قلمرو فرهنگی- تمدنی و شهرنشینی و نیز گستردگی پژوهش های انجام شده تاکنون، از برجستگی ویژه برخوردار می باشد. از این رو در این مقاله، به ارائه مد لهایی درباره شکل و قالب بندی آن پرداخته شده است. اما علی رغم چنین مدل های کلیشه ای، نمی توان به راحتی از یک سنخ واحد سخن به میان آورد. زیرا در عین وحدت این کثرت به گونه ای است که حتی در درون یک واحد سیاسی (کشور) به تبایناتی برمی خوریم. از این رو، هدف از پژوهش نه تنها تحلیلی از ساختار فضایی و ریخت شناسی شهر قدیم لار به منزله یک شهر متوسط با پیشینه کهن و فراز و فرود بسیار می باشد، بلکه با میزان آن با مدل های ارائه شده در این رابطه نیز ارتباط دارد. برای دست یابی به این هدف از روش های تحقیق جغرافیایی و مطالعات تطبیقی به گونه اسنادی، چون چندین بار سفر در راستای مکان گزینی، پرسشگری ها و مشاهده ها بهره گرفته شده است. از سوی بنیان های نظری (فرضیه ها) استفاده شده است. نتیجه بررسی ها گواه می دهد که بافت کالبدی این در مواردی چه به لحاظ موقعیت طبیعی و چه به لحاظ ساختار و کارکرد ها با مدل های یاد شده هم پوشی دارد. اما از سوی دیگر انحراف هایی، به ویژه با تأکید بر کارکرد و ساختار ها و حوزه نفوذ و حوزه جذب را نشانگر است. این کارکردها عبارتند از: 1. کارکرد حکومتی؛ 2. کارکرد اقتصادی؛ 3. کارکرد فرهنگی- مذهبی؛ 4. کارکرد مسکونی و سرانجام کارکرد "مکان مرکزی". Aubin, J. (1955). Referance Pour Lar Medieval. Journal Asiatiqne, 243, 491-505. Calmard, J. (1986). Lar, Laristan. The Encyclopaedia of Islam. New Ed. E.J. Brill. 5, 665- 679. Leiden. Dettmann, K. (1969). Damaskus. Eine Orientalische Stadt zwischen Tradition und Modern. Erlangen. Ehlers, E. (1990). The City of the Islamic Middle East; A German Geographer, S Perspective. In: Papers in Honor of Prof. Ehsan Yarshater, Acta Iranica, Xvi, 30, Leiden. Encyclopaedia Iranica (1989). S. Bazar. (Yarshater, Ed.). IV, 21-52. Minorsky, W. (1936). Lar. In: Enc. Islam, I. 3.,17-18. Pohanka, R. (1983). Die Historische Bauwerke der Stadt Lar, Sudiran. In: Archaeolo – gische Mitteilungen aus Iran. Bd. 16, 325-362. Pohanka, R. (1986). Karvanenwege and Karvanserais in Laristan: Die Strassenabschnitte Lar- Djahrom, Lar- Khundj und Lar- Bastak. In: Ani, 285-307. Scharabi, M. (1985). Der Bazar. Das Trditionelle Statt- Zentrum in Nahen Dsten Und Seine Handels Einrichtungen. Erst Wasma, Th Verlag. Tuebingen. Stoeber, G. (1995). Modelle in Wissenschaft und Unterricht. Das Beispiel “der Orient- alisch- Islamischen Stadt”. In: Inter. Schnlbnchforschung, GEI, Braunschweig. 17 Jhg, 283 – 299. Wirth, E. (1982). Villes islamigues, Villes arabes, Villes Orientales? Une problema – tigne face ou changement. In: La Ville arabe dans l, Islam. Ed: A. Bouhdiba and D. Chevalier. Tunis. Wirth, E. (1991). Zur Konzeption der islamischen Stadt. In: Die Welt des Islams. Bd. 31, 50–92. Campfire, E. (1985). Campfire of Travel. (K. Jahandari, Trnas.). Kharazmi Publication. Tehran, 3rd Ed. (In Persian). Castello, F. (1990). City in the Middle East. (P. Piran & A. A. Rezaei Trans.). Nei Publication, Tehran, 1st Ed. (In Persian). Characteristics and Problem of the Muslim World. Immam Hossain Uni: Tehran 1992, 23-29. Chardin, J. (1957-1967). Chardin of Tour. (M. Abbasi. Trans.). Amir Kabir Publications (In Persian). Eghtedari, A. (1993). Old Laristan and Larestani Culture. Contemporary World of Publications. Tehran, 2nd Ed. (In Persian). Eghtedari, A. (1994). Convoy of Age. The Political-cultural Memories of Seventy-Year-Old. Publisher; author.Tehran, 2nd Ed. (In Persian). Ehlers, E. (1995). Islamic-Orient of City. Model and Reality. New writing: Mohammad Hassan Zia Tavana and Mostafa Momeni. In: Geographic Research Quarterly, 9(1), 27-66 (In Persian). Encyclopaedia of the Islamic World (1994). Bazar-Baj (b of Letter, three of part). Under Supervision Seyyed Mosstafa Mirsalim. The foundation of Islamic Encyclopedia, 305-405. (In Persian). Fakhary Tehrani, F. (1998). Baths in Time View. Soffeh. Shahid Beheshti University, 10(30), 94-106 (In Persian). Fakouhi, N. (2005). Urban Anthropology. Nei Publication, Tehran, 2nd Ed. (In Persian). Hosseini Fasaei, H. M. (1989). Farsnameh Naseri. Correction and Margin: Mansour Rastegar Fasaei. Amir Kabir Publications, Tehran, 1st Ed. (In Persian). Mumford, L. (2003). Civilization and Civil Society in the Context of History. (A. Azimi Bolourian, Trans.). Rasa Cultural Services of Publication and Center for International on Civilizations Dialogue. Tehran, 1st Ed. (In Persian). Nami Isfahani, M. M. S. (1988). The History of Giti Gosha in the History of Zand. Iqbal Publication, Tehran, 1st Ed. (In Persian). Sadidol Saltanah (kababi, bandar abbasi), M. A. (1985). Bandar Abbas and the Persian Gulf (Informing People in the Conditions of Bandar Abbas). Correction and Introduction: Ahmad Eghtedari. Trying to Ali setayesh. Book World of Publication, Tehran, 1st Ed. (In Persian). Siloofigiora, D. (1985). Dengarcia Siloofigiora of Travel, Ambassador of Spain at the court of Shah Abbas I. (Gh. Samiee. Trans.). New Publication, Tehran, 1st Ed. (In Persian). Soltanzadeh, H. (1987). An Introduction to the History of City and Urbanization in Iran. Blue Publication. Tehran, 1st Ed. (In Persian). Statistical Calendar of Fars Province (1967 -2007). Statistical Center of Iran, Tehran. (In Persian). Verjavand, P. (1979). The Role and Importance of Ponds and Water Storage in the Urban Context of Iran. Art and People, 14(168), 4-8 (In Persian). Zia Tavana M. H. (1992). Neighborhood, Texture and Its Structure in Islamic-Orient of Cities. 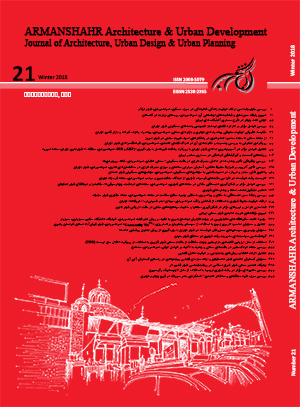 Journal of Earth Sciences, Shahid Beheshti University, New Era (1), 173-200 (In Persian). Zia Tavana M. H. (2002). Qaisarie Lar of Market. Nei Publication, Tehran, 1st Ed. (In Persian).